Known for their fast-growing, upright habit, poplar trees, unfortunately, produce weak, porous wood. Their tall, graceful forms look best when planted in a row along a country roadside or behind a field. Although short-lived, they do provide a useful function in specific growing conditions. In general, trees that grow quickly also die quickly; poplars are no exception. Under good conditions, they may live 30 years. Occasionally, a poplar may live 100 years, but that degree of longevity is rare. Most succumb to disease, pests or rot within 20 to 30 years. Poplar wood is soft and spongy, making it prone to rotting. Not only do the branches rot, but the whole trunk may rot, leaving a hollow space. Heavy winds can topple these trees, creating a dangerous situation. The limbs are also prone to breakage during storms. Poplars are prone to suckering, especially when the parent tree begins to decline. These suckers sprout up all over the yard and are difficult to eradicate. The shallow roots of the poplar produce lumps and knots in the yard. Poplars are vulnerable to many pests and diseases, including canker, fungal leaf spot, borers and bark beetles. These problems further reduce the strength and vitality of poplars. After properly identifying the problem, treat insect and disease outbreaks with dormant oil spray or a fungicide, based on the recommendations of a local county extension office. Many of these problems have no cure and ultimately kill the tree. Poplar strength varies based on the tree variety. The Lombardy poplar is generally considered the weakest, short-lived and most prone to disease, according to the North Dakota State University Extension Service. Tower poplars and the upright European aspen are the best choices for anyone determined to grow poplars. Silver poplar, unlike most of its relatives, is very hardy, but is also very invasive, making it a poor choice for most gardening situations. Poplar trees are generally not suitable for the typical suburban yard, but they work well in rural areas. They grow quickly and, when planted together, produce stately privacy hedges and wind breaks. Plant them on acreage, where they have plenty of room and where they pose no risk to nearby buildings. 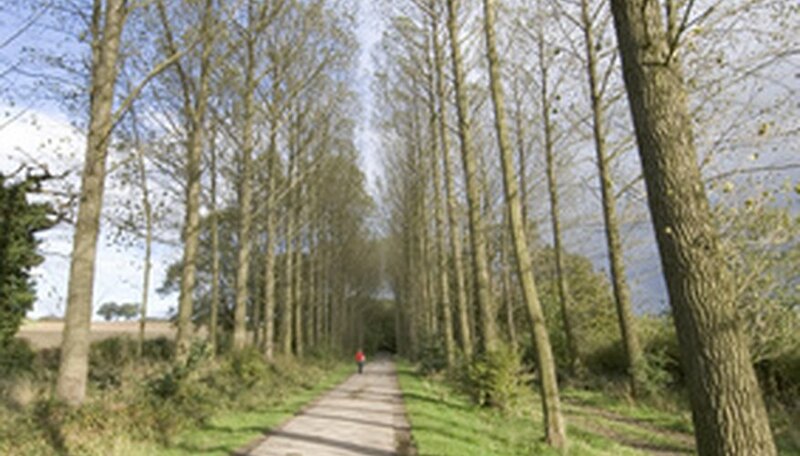 What Is a Poplar Tree?